I was browsing around on Pinterest recently and I came across a hat with cat ears. 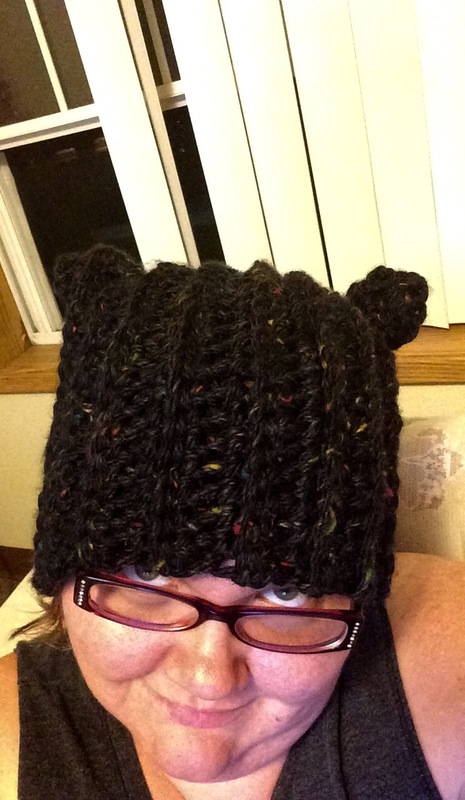 I looked at it for a bit and I crocheted my own version without following the pattern. I used Hometown USA yarn. I had to use one and a half skeins since this had mixed colors. It seems to be the a universal rule in the yarn world, if you mix yarn colors have half the amount of yardage with the same price. Oh well. I really like the hat. It’s soft, cozy, and warm. So, once again, I’m finding it difficult to keep with my goal of posting every week. School has just started and I’m a full time student again this term with 13 credits and a lot of homework. I don’t want to give up though. I still want to pursue making and selling things, but time doesn’t seem to want to be on my see this term. I will try hard though.